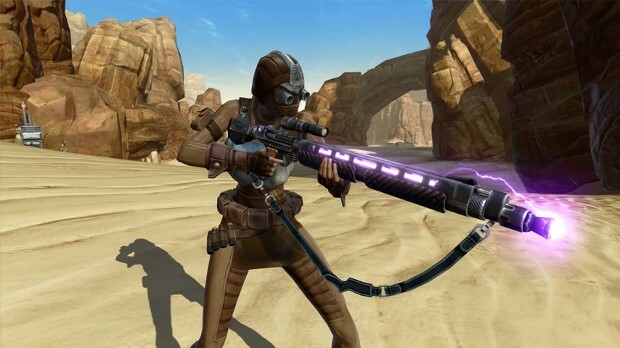 Star Wars the Old Republic is introducing a new way for players of the free-to-play game to add some flair to their weapons — or some of them, at any rate. Weapon Tuning will allow players to add some cool looking effects to any weapons with an available Tuning Slot. These weapons can be obtained in a variety of ways including the Cartel Market, Vendors, Flashpoints, and more. These weapons will require a Weapon Tuning which can only be acquired via Cartel Market Packs at the moment. The first Weapon Tuning produces Lightning effects and is available in the Plunderer Pack. The Tuning can be combined with the weapon using the Field Modification window or an Item Modification Station. Once combined, players will need to pay a fee to remove the Tuning from the weapon. Not really that amazing considering the fact that you have to get lucky with the new cartel packs to get the weapon tuning items. That’s amazing. Glad I got back into the game, will make getting these easier.